which is your favourite 7 Series? All this E38 talk had me motivated to start working on my project; we ripped out the blown M62 and autotragic to make room for better things to come! I was giving a hand with the 6spd swap on a 2001 740il for the last two weeks, we just finished it. Drives like a dream, some parts had to be ordered from overseas to make it as close to oem as possible, some had to be custom made. Here is an interesting fact. At one point BMW was actually considering building a 740il/6. Gotta smile looking at all the E38 Love! They have stick 740's in europe, i buddy of mine owns an original 1995 740i in 6spd manual in Ukraine, he imported it from sweden. Notice the "l" in the model name. So much want in this thread. I know what you mean! The more i drive it, the more i LOVE it! Even in winter, with all season tires, it feels capable at all times (and i have owned tons of AWD and FWD cars in past winters). They are very safe cars; customer of mine recently hit a tree head on. It was hard enaugh to move the frame rails a foot and a half, push the engine back several inches, bend the driveshaft, bend the crank shaft and shatter the front of the engine. The structure of the car was not affected, doors still open fine, and he walked away without a scratch! Nice find Terry. 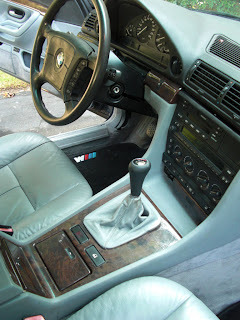 Only four 740i with M62TU were built in that color. Three of them with Sand Beige interior and one with a black one. Damn... and my favourite is Red on Tan/beige.